The high-frequency erw steel pipe is different from the ordinary welded pipe welding process. 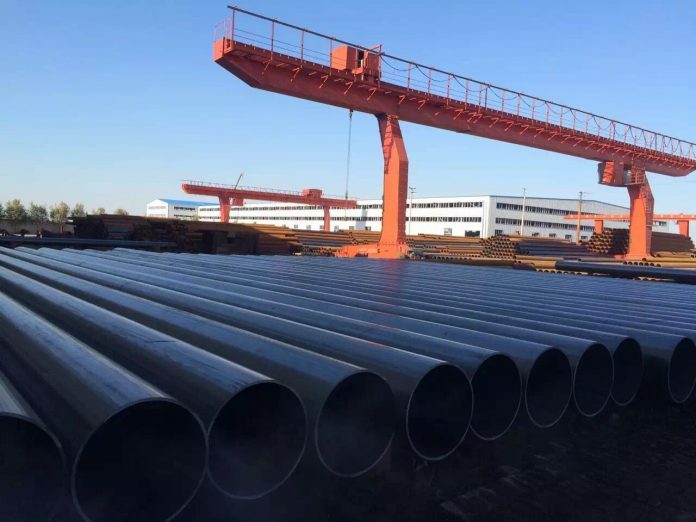 The weld bead is melted from the base material of the steel strip body, and the mechanical strength is better than that of the general ssaw steel pipe. The surface is smooth, high precision, low cost and low weld seam height, which is beneficial to the coating of 3PE anti-corrosion coating. The welding method of high-frequency welded steel pipe and submerged arc welded pipe are significantly different. Since the welding is done instantaneously at high speed, the difficulty of ensuring the welding quality is much higher than that of the submerged arc welding method. High-frequency welding mainly uses the skin effect and proximity effect of high-frequency current, so that the current is highly concentrated on the edge to be welded, so that it can be heated to the soldering temperature (1130-1350’C) in one hundredth of a second. Then, pressure welding is performed under the action of a squeeze roller. This welding method has a series of advantages: the weld heat affected zone is small, the heating speed is fast, so the welding speed and the weld quality can be greatly improved, and the strip which is not pickled, shot blasted and trimmed can be used as the blank, and at the same time Welding alloy steel, high alloy steel and non-ferrous metal pipe, greatly reducing the unit power consumption. A variety of metal welded pipes can be produced with a single welding equipment. For different metals, only the welding power and welding speed have to be changed accordingly. The welding current flows along both sides of the bevel of the tube blank, and a loop is formed by the meeting points on both sides of the groove near the pressing roller. The direction of the current on the slopes on both sides of the tube blank is reversed. Therefore, the proximity effect concentrates the current on the surface of the groove. The higher the current frequency, the more concentrated the current is on its surface. The resistor 4 increases the concentration of the groove heating because it increases the inductive reactant of the current flowing around the tube blank. With this welding method, the contact head can be placed at different distances from the meeting point (30-200 mm). When the tube blank is moved, the contact head can slide along the top or bottom of the edge to be welded. The solution in which the contact head is placed on the edge to be welded is the most widely used, because the structure of the welding device can be made simple and reliable.